If you’re thinking about buying a newly built home, you’re probably already aware of many of the benefits, including better warranties, higher energy efficiency, and even the option of picking out appliances and finishes. It seems obvious to point out that the average family today has far more electronic devices than a family in the 1960s. Not only do we tend to have multiple laptops and mobile devices that need charging, we also have extras like DVRs, game consoles, high-definition TVs, more advanced appliances, security systems, and even different lighting needs. The problem is homes built in decades past were wired to accommodate the energy needs of that day—not 2015. Buying a new home means you won’t have to go hunting for outlets or risk overusing power strips. Have you ever invited over dinner guests, only to ignore them while you’re holed up in the kitchen? Older homes tend to have smaller, distinct rooms that can make entertaining a bit of a problem. But new homes tend to favor open floor plans, with spaces flowing easily into one another. So when you’re preparing the salad in the kitchen, you can still keep up conversation with the guests in the dining or living rooms. Open floor plans, along with vaulted ceilings and additional windows that are typical of many new homes, also help new homes feel more spacious and airy. In a new housing community, no one’s an outsider or new to the neighborhood. Everyone is coming in at roughly the same time and are often willing to build neighborly bonds right away. As some new communities are built to attract people in a certain stage of life (such as young families or retirees), you’re likely to meet people who already share a lot of common ground with you. 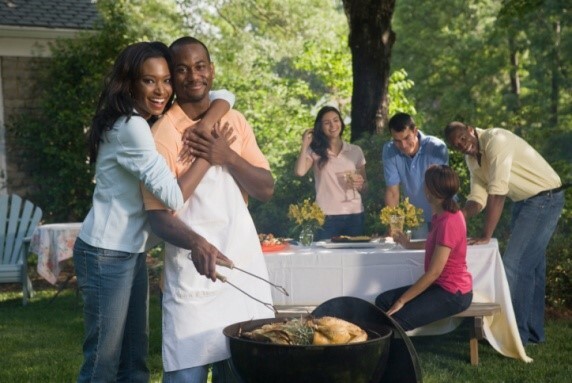 Some new communities throw parties or picnics to encourage new neighbors to meet one another. New communities also tend to have better amenities, such as pools, basketball courts, playgrounds, and walking trails. Getting out and enjoying these extras also means you can meet more of your neighbors, and start building the bonds of community. If you’re interested in buying or building a new home, talk to someone at The Haro Group. We’d love to answer your questions and get you started on your journey!